Taken a few days ago on St. George Island, FL. A group of 6 or so of these little birds (smaller than a house finch) were making short individual flights less than 10 yards, moving the group through the dunes within sight of the gulf. Definitely American Pipits--always fun to see. This is actually a Palm Warbler. 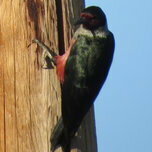 Note the yellow undertail coverts. Thanks, Bird Nut. I guess we don't yet have consensus. Looking at Palm Warbler pics, mine seems to match the Fall plumage pic. Yes, this is a Palm Warbler, due to the yellow vent. Cool! Thanks, all. Glad to add Palm Warbler to my life list. When I wrote "NOT", I was agreeing with The Bird Nuts that this wasn't an American Pipit, contrary to what I thought. Yeah Jerry. Saw that after I posted. Wish I had seen it before I posted. Thanks gain.